The Royal Society of Public Health Arts Award winning project, 'Who Cares?' was developed in collaboration with The Whitworth art gallery and Manchester Royal Children's Hospital. It saw Lucy working with young people who were resident in the hospital's CAHMS in-patient unit because they were experiencing difficulties with their mental health. Inspired by pieces from The Whitworth’s collections and in discussion with the young people, Lucy created murals that commented on the relationships that were forming amongst the young people and staff as they worked together. This phase of the project led into the production of a series of anonymised portraits of the young patients which were exhibited at The Whitworth alongside highlights from the gallery’s collection of portraits. Within the public gallery, new temporary walls were erected to create a closable private room in which to show the work. It could be reserved for use by patient groups, medical students and clinicians. The exterior was subverted to reflect our understanding of sterile and cold clinical environments, whilst the interior housed comfortable seating and a more welcoming, contemplative space. Acrylic on canvas, 1m square. 'Who Cares?-If You Only See The Illness, You Miss The Person' Exhibition at The Whitworth Art Gallery. 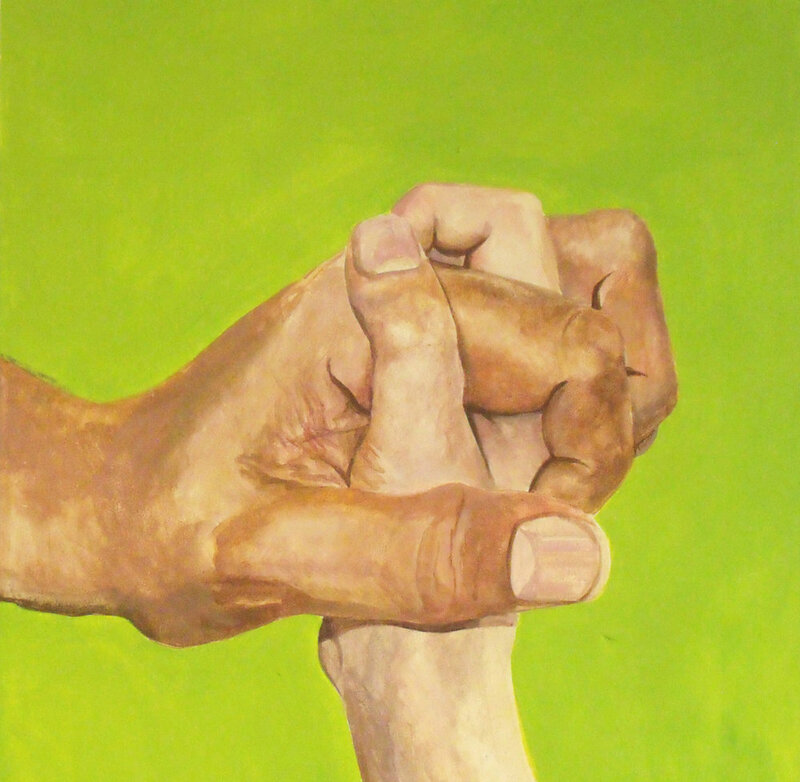 Portraits of the hands of the young people who were involved with the project. Inspired by Sonia Boyce's 'Applause' which the group encountered while visiting The Whitworth's 'Walls Are Talking' exhibition of subversive wallpapers.